⚓ T150766 Distinguish "mentions" from "subscribers"
"Party Time" token, awarded by Elitre. AFAICT, there is no way in which Phabricator or Gmail can tell me whether "I am being mentioned in a certain task" vs "I was already among the subscribers", right? Looks like other colleagues of mine would really appreciate being able to tell whether someone is actively calling for our attention, maybe even help, and hence having a certain priority, vs "this is the nth task I get just because I'm subscribed to a topic for which my interest may vary", which may or may not be read (my Phab folder has 18k unread messages and counting). https://secure.phabricator.com/T9031 "When I ignore subscription changes, I'm not notified of being cc'ed"
https://secure.phabricator.com/T9412 "Annotate all the reasons that a user is included on the recipient list for mail"
https://secure.phabricator.com/T4654 "Add 'always email me' type option for direct mentions, ccs, assignments, etc"
https://secure.phabricator.com/T9161 "How can we fix "too much mail"?" 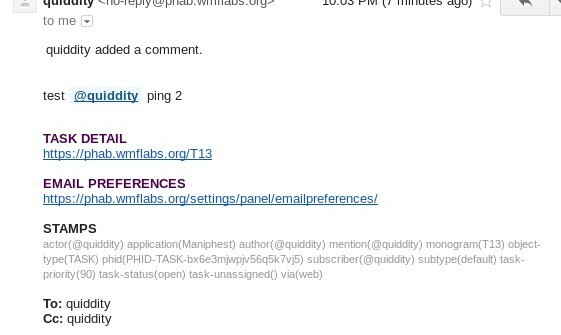 https://secure.phabricator.com/T6297#88557 "Maniphest email notification doesn't say why I'm receiving it" - a custom mail header could include an additional "User has been mentioned when this comment got added" value. I can imagine that upstream maintainers would refuse this request to somehow "distinguish mentions from subscribers", as it might not be a "root problem" to solve. When it comes to why this task was created, it looks like "too many notifications" is the underlying problem? Maybe you want to be subscribed to less projects and tasks (or actively mass-unsubscribe from some), or fine-tune your mail notifications, or use web notifications for less important things and mail notifications for others. @Elitre is currently subscribed to 1016 individual open tasks and a member of 33 projects. The latter means that by default you get notifications for all task changes associated to these projects if you have not explicitly clicked "Disable Mail". I am not sure if you really want that. 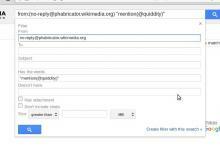 "How to effectively manage Phabricator email notifications" upstream docs. "How to fix 'too much mail'" is a related discussion in upstream. Even if I were following just 10 tasks, I'd still want the ability to tell whether I'm being pinged or the task is just part of the stuff I'm usually following, especially since both things can happen for a given task. Thanks for listing them. https://secure.phabricator.com/T6297#88557 also feels relevant - a custom mail header could include an additional "User has been mentioned when this comment got added" value. As I kept wondering why you do not plan to follow (means: "read") notifications from tasks that you decided to follow, I realized: Am I correct that a higher urgency is implied (and hence faster attention required) when being explicitly mentioned in a comment, compared to a task you "just follow" by being subscribed? Edit: Note to myself: Yes. That's what Erica already wrote in the task description but in other words, Andre. Use case: I write the technical newsletter for the Wikimedia wikis. This means I'm subscribed to a lot of tickets that would be difficult for me to unsubscribe from, because I'd miss when someone tells me "hey, this will go into production next week" or there's a relevant update. There's enough traffic that I miss some stuff, but I'd miss even more if I were subscribed to fewer tickets. If there was a custom mail header or at least anything, it'd help immensely. 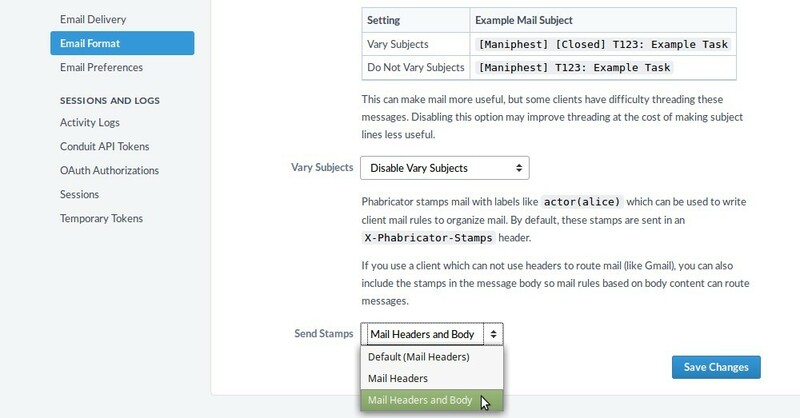 https://secure.phabricator.com/T4654#235478 implies that at some point the X-Phabricator-Mail-Stamps header will include mention(@username). So when that happens, this task could be resolved? Mail stamps are available now. The upstream documentation still doesn't cover this feature in detail, however, you can find some details about how it works in the changelog entry. Also see https://secure.phabricator.com/w/changelog/2018.06/ for how to use that in broken software like "GMail". 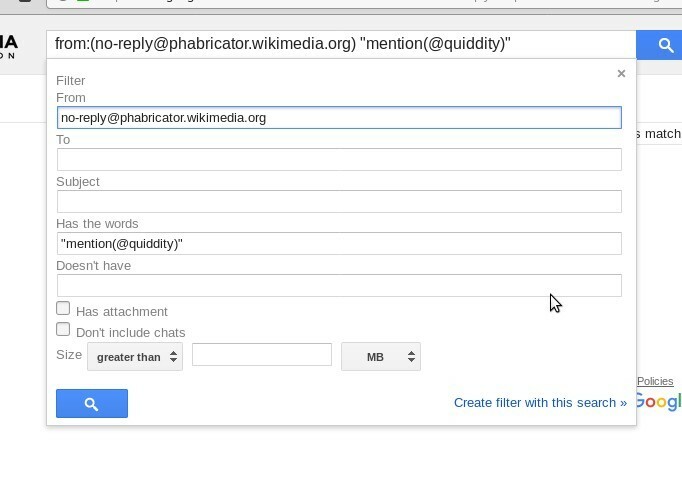 and create a new filter in gmail, using "mention(@YOURNAME)"